Coincidentally, the literary words of the ex-Secretary of State and the actions of the current President of the United States came into alignment this past week. While Hillary Clinton's book "It Takes a Village" spoke about the responsibility of child-rearing extending beyond the purview of a mother and father, metaphorically that same premise can be applied to saving the wildlife in Africa. Poaching and trafficking is threatening Africa's wildlife, where the black market for illegal animal products yields $7 to $10 billion annually. Greed is a motivator for this nefarious activity where a rhinoceros can fetch $30,000 per pound and elephants' ivory tusks go for $1000 per pound. And surprisingly, the U.S. is the world's second largest global market for such products, just behind China and other countries in Southeast Asia. 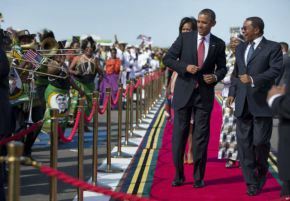 Grant Harris, senior director for African Affairs on the national security staff of the White House told reporters that in accordance with the executive order, the administration would seek to change regulations to make sure these animal products can no longer be shipped to the United States. So if it takes a village to aid in this important work, who else is supporting efforts to quash the black market? 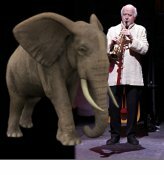 In my post, "Paul Winter's Summer Soltice Dedicated To Saving The African Elephants," new age artist Paul Winter and his Consort held a concert in New York City on June 22 focused on this cause. As a pioneer of integrating animal calls and instrumental music, Paul Winter has been successful in combining animal sounds in previous albums dedicated to the wolves, the whales and this coming year, he will release the "Song of the Elephant." Additionally, Winter is now composing a "Flyways" album that will incorporate the sounds of migrating birds who cross the Great Rift Valley in Africa, the Middle East and Eurasia. The David Sheldrick Wildlife Trust is an important charity, established in 1977 to honour the memory of the famous Naturalist, David Leslie William Sheldrick, the founder of Tsavo East National Park in Kenya. Sheldrick spent his entire life dedicated to the protection and preservation of endangered species such as the African elephants and the Black Rhinos. There's a poignant quote on the Shendrick website that best sums up why it's so necessary to help save these beautiful creatures. "People say to us: 'How can you carry on, amid so much heartbreak and tragedy; amid so many setbacks and such profound suffering? '- The answer is that we take our cue from the elephants themselves, who witness suffering and heartbreak on an almost daily basis, yet still have the courage to turn the page and focus on the living." If you'd like to consider becoming part of the global village that's saving the African Elephants and the Black Rhinos, you can help by donating to the cause? Donations can be made online directly via PayPal, or by using a credit card. Other methods include sending checks by snail mail or a wire transfer. All methods can be found on the ShendrickWildLifeTrust.org website. This is an Interesting Recipe for a BLT -- The Animal Video of the Day!! !